SOCO LED String Lights: We provide friendly, easy-to-reach support and our customer service purposes "To meet consumers" satisfaction with high quality products and enjoyable purchasing experience. 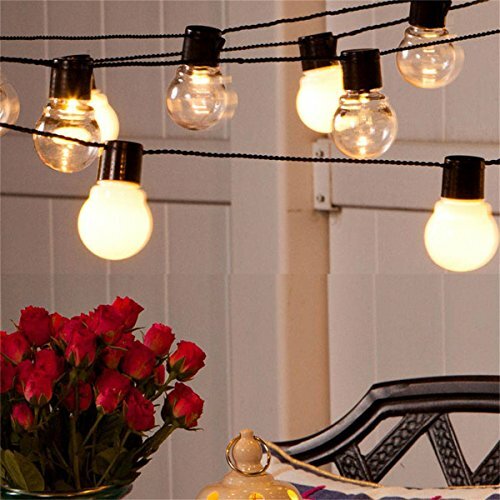 -Solar-powered decorative string lights, with no extra electricity consumption incurred. totally Eco-friendly product no pollution. -Easy to install and operate, recharged by solar panel under sunlight automatically. -Efficient absorption & conversion, less charging time and more working time, full charge of 6 hours will work more than 8 hours. 1. During the daytime, solar panel gets sunlight and converts solar energy to electrical energy stored in the rechargable battery. 2.The battery will converts into power when it lights up in darkness. 3. A Ni-MH AA rechargeable battery in solar box, Which is durable. 1.Try to soften the ground before inserting the stake, do not insert by force or may result in product damage. 2. It is suggested the solar panel to be fully charged for 6 hours at the first use. Considering the main function of this lights is used for decoration, so maybe these will not be as bright as a household light bulb, please note before your purchase. ➤SOLAR POWERED -- LED solar lights use solar panels, which can convert solar energy into electric energy and storage in the built-in battery let the lights lit up. These LED lights decorate your garden with energy from the solar and do not require additional cost. ➤WATERPROOF -- IP65 waterproof grade can work on different weather, including heavy rain and snow, perfect for indoor and outdoor decorations. If you have any questions about this product by SOCO, contact us by completing and submitting the form below. If you are looking for a specif part number, please include it with your message.